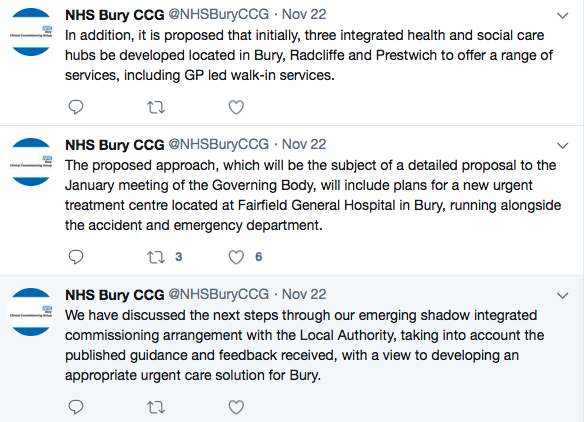 Bury’s NHS Clinical Commissioning Group (CCG) used a verbal update reported through several Twitter posts to inform residents that the two Walk-In Centres in bury (Bury and Prestwich) are not closing on 31 March 2018. 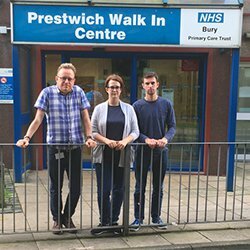 Residents may recall that the consultation on the closure of both centres was ‘paused’ earlier this year by the CCG, following new guidance from the Government on urgent care. The guidance requires that each NHS area (i.e. the whole of Bury) has an Urgent Care Centre to deal with some of the more minor issues which do not warrant a visit to A&E. Bury is going get one, located next to A&E at Fairfield Hospital. (It is worth asking whether there will be similar provision at North Manchester and Salford Royal which are the A&Es people in the southern end of Bury tend to use. Yes – the Walk-In Centre will be remaining open after 31 March 2018 while the new facility is developed. Uncertain – because we don’t know what ‘including GP-led walk-in services’ means – it could just mean that there is some provision for ‘just turn up’ GP appointments, which is a welcome thing, but it does depend how many these are, and at what times. Many people’s GP’s are not based in these health centres. No – the current 7 day a week, nurse-led open access service that people find so helpful seems certain to be finishing. The CCG will receive a detailed report at it’s January meeting, and hopefully some of these questions and uncertainties will be addressed then. Our local Lib Dem Councillors are going to ask for a meeting with the CCG so please let us know what queries and issues you would like to discuss with them.